The TG-LPC11U35-501 Board from CQ Publishing is a easy to use ARM Cortex-M0 rapid prototyping board in a breadboard-friendly 40-pin DIL format. 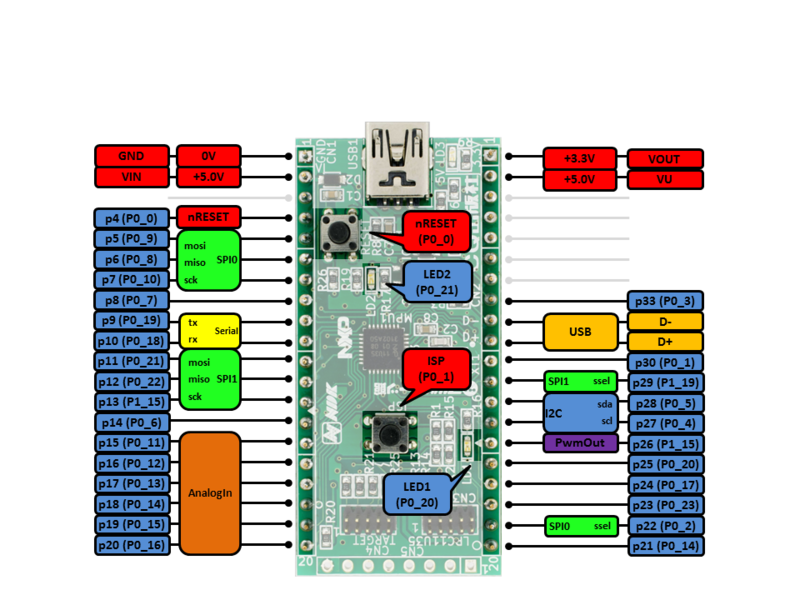 The LPC11U35, like other NXP Chips includes an internal ISP bootloader, which allows you to program it using an USB connection. See prototype to hardware in the cookbook for more details about this. It can also be programmed using Serial Wire Debug (SWD), a protocol similar to JTAG, but using less pins, using software such as uVision4, or LPCXpresso's software. This is useful if you want to debug your applications on the chip, being able to add breakpoints, as well as stepping through individual lines of code in order to find a bug. TG-LPC11U35-501 board is designed by Transistor Gijyutu of CQ Publishing and distributed by Marutsu Elec Co.,Ltd. To compile a program for this board using Mbed CLI, use lpc11u35_501 as the target name. CQ Publishing is a Japanese media company that publishes books and magazines of electronics and computer related technologies.